We have known for a long time that connoisseurs who prefer to roll their own cigarettes also come down in favour of Raw papers and this is because these papers and tips are made from an all-natural, vegan, chlorine-free smoking paper. This Spanish company use no chemicals in the paper making process; this is why the papers have that sought after thin brown almost translucent look. They also do not use anything other than natural hemp glue. When this burns, there is no release of any kind of toxic emissions, giving you a cleaner safer smoke. With the classic box, there is a roll of no less than three metres of Raw paper and 30 pre-rolled tips which will help you create the size of smoke that suits you. Thoughtfully Raw has combined the papers and tips into a single box with a convenient magnetic flap, this holds the paper down whilst you pull out the amount needed tearing off on the cutting edge. Because no two people roll in the exact same way, understandably whether you choose to have the flap open or closed when you pull out the paper is up to you try both and find the most convenient way for you. 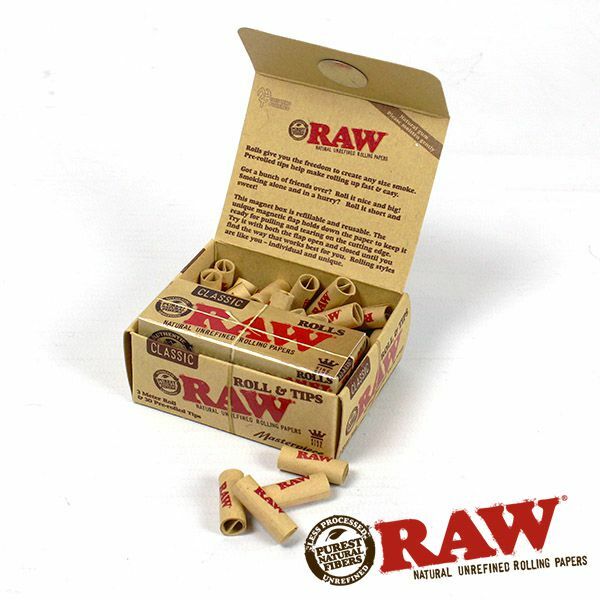 When you have used all the paper and tips, simply refill and re-use the Classic Raw box. So whether you are having a smoking party with a bunch of friends, having a quiet smoke on you own, just roll it the way you like it, nice and big or just a small satisfying short and sweet roll. There are smoking papers and then of course there are Juicy Jay’s flavoured papers, and with this trendy upmarket box of 24, comprising eight tasty flavours, generally with three of each flavour, which are randomly selected, but usually can contain Banana, Green Apple, Raspberry, Watermelon, Blackberry Brandy, Peaches & Cream, Very Cherry, and Blueberry, although we cannot guarantee that there will be exactly three rolls of each of those. We can say that each individual roll is around 5 metres in length and is imbued with the delicious juicy flavour, not the gum strip alone, each paper is sure to be sweet to the lips. Juicy Jay produces these papers by using a triple dipped system, allowing the entire paper to safely be infused with delicious flavours. Each paper has colourful designs printed with soy ink which corresponds to the flavour, for example raspberry has these all over it, and importantly has natural gum for a delicious a tasty smoking experience. Trying a box of Juicy Jay’s perfect pick ‘n’ mix box you will be able to see if there are one or two particular flavours that you prefer, this will enable you to buy these from our comprehensive selection. Why not use the Mix ‘n’ Roll Box of 24 to try some of these amazing flavoured papers, we are sure that you will love them! Not everyone is adept at rolling and there is no shame in that, some people just never learn the knack, whilst others can make a perfect cigarette singlehanded, almost whilst holding a glass of beer in the other! It is for those who unashamedly confess to being unable to roll and for them, but of course not exclusively, we off the limited edition Raw Wiz Khalifa King Size Cones are 100% additive free and 100% organic. RAW cones can often be out of stock or very hard to come by and this is because they use a water-based gum that takes a long time to dry, unlike some other cones that use a chemical glue which dries almost instantly. This product is completely organic and completely additive free, small amounts are produced, but most of us would rather occasionally have to wait and get quality than settle for second best. These Limited Edition RAW Wiz Khalifa Kingsize Cones offer the same great quality paper that we have come to expect from RAW but with the LTD Wiz Cone branding, perfect for anyone wishing to enjoy the awesome quality of the RAW papers but have trouble rolling their own. There are arguments for and against rolling your own cigarettes, many people believe that they are better for you than (or as good as they can be considering) pre rolled cigarettes. There is no data available to show this, but it’s becoming an increasingly popular option for younger people. However if you are sick of buying pre-rolled cigarettes and want to explore the world of roll your own RYO then we have all the tools to help you here at Shiva. We stock a huge number of well-known brands who produce the highest quality of rolling papers and cones. These include traditional rolling papers and flavoured rolling papers and blunt style wraps. For familiarity we sell Rizla, the top selling papers. We also have in stock Roor Papers which are slow burning and flavourless, unbleached and chlorine free Pure Hemp papers and Transparent rolling papers made from 100% cellulose which are odourless and 100% biodegradable. Fancy some flavoured rolling papers then check out our offerings from brands such as Brown Sugar, Dragonfly and Juicy Jay. Choose from fabulous fruity flavours to crazy cannabis flavours courtesy of Juicy Jay for that extra edge. We have Brown Sugar rolling papers which allow you to smoke your tobacco in tobacco based papers. And popular rolling paper brand Dragonfly have created some of the freshest flavours around, which are foil wrapped they don’t lose any flavour once opened. For those who struggle with the art of rolling, pre-rolled cones from JWare and Mountain High will enable you to smoke without the hassle that rolling brings. And if you like smoking lose tobacco, but can’t leave your precious pre-rolled cigarette feel behind then why not try one of our Cigarette Tube Filling Machines. You can fill them with your own tobacco and create cigarettes which look like straights, no one will know! Mountain High Cones – for the perfect smoke! Want to roll yourself a big fat cone but don’t have the time or the expertise? Then Mountain High Cones are the answer. Made from the highest quality paper, Mountain High Cones are perfectly pre-rolled cones that will save you a lot of hassle in the long run. Simply fill up your pre-rolled cone with your favourite herbal and tobacco mixtures and you’re ready to go. Your friends will be jealous at your perfectly rolled cones, but you’ll know the secret. Mountain High Cones are available in a number of different sizes from regular and kingsize to the huge Giga Size cone which measures an impressive 280mm long. Each cone comes with a pre-installed filter for a smooth smoke and are perfect for just about any occasion. With prices starting at just £1.99 for a 3 pack, Mountain High Cones are a time saving accessory every smoker should have. Want to smoke a big cigarette but don’t have the patience to roll one? Then Torpedo Kingsize Pre Rolled Cones are the answer. Simply fill up the cone with your favourite tobacco mix and its ready to go, no faffing around with dog-eared papers or trying to find a suitable surface to roll. Each pre-rolled cone comes in a handy plastic tube that can be used to carry your ready rolled cigarette when you need it. Torpedo Kingsize Pre Rolled Cones come is four tasty flavours, blueberry, peach, strawberry kiwi and white chocolate, and with more flavours to come there is bound to be something for everyone. These pre-rolled cones are tobacco free, great for if you are trying to cut down and are slow burning so you can savour the flavour; Torpedo Kingsize Pre Rolled Cones are available now for just £1 each. Not a fan of flavoured papers? Then why not check out our range of standard pre-rolled cones, available in a variety of sizes. Want to try something new when smoking your hand rolled creations? Then why not try Dragonfly Flavoured King Size Papers. These slow burning king size papers are made from the finest quality hemp and are foil sealed for freshness. Available in 10 tasty flavours including blueberry, chocolate, mango and strawberry, Dragonfly Flavoured King Size Papers are the perfect addition to your smoking ritual. With 33 leaves of paper in each pack and costing just £1.25 each, these papers are sure to get your taste buds going. For those who want to stand out from the crowd even more, why not try Dragonfly’s Invisibles Flavoured King Size papers; these two are available in a range of flavours and are completely transparent, just what you need to show off to your mates. So, now all you have to do is figure out which of the tasty flavours you’re going to try first! Rips Papers – how long can you roll? Exploding onto the market in 1982, Rips Papers distinctive rolling papers has captured the imagination of a generation who wanted to roll their own cigarettes the size they wanted. The original and still the best, Rips has added new flavours to its line-up of paper rolls meaning that you have even more choice. Rips paper rolls allows smokers to make their cigarettes as long or as short as they want; they are made from the best quality paper and natural vegetable gum, and are watermarked for authenticity. Each pack of Rips slow burning paper on a roll are approximately 37mm wide and up to 7 metres long meaning that you can roll to your heart’s content. Available in original and hemp varieties, Rips Papers also offer a range of tasty flavours including banana, cherry, chocolate and strawberry, and start at just 99p per pack. Sometimes kingsize papers aren’t big enough, so what do you do? Grab yourself RAW Supernatural 12″ Rolling Papers that’s what. Gone are the days of carefully sticking two kingsize papers together only to have it fall apart. These 12 inch long papers are great for those who want a bigger smoke and are made from the highest quality materials. They come unbleached and are vegan friendly meaning that everyone can enjoy the smooth smoke. Each pack contains 20 huge papers and are available now for £6.49. Why not check out Shiva Head Shops range of filters and roaches to add the finishing touch to your massive smoke.